Charts in PowerPoint are good. Office 2007 is better! With a new kid on the block called "Oomfo" ,the charts are almost best! 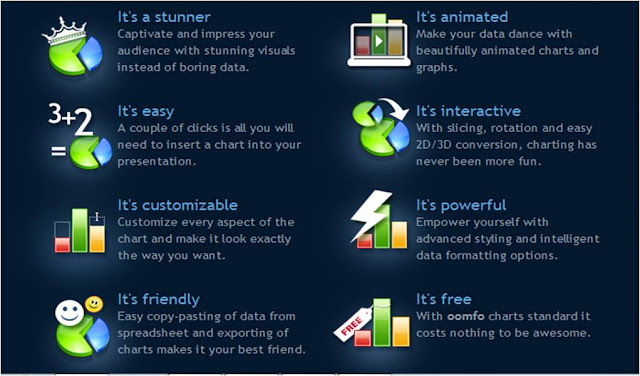 Oomfo is an PowerPoint plug-in that helps you create good looking ,animated and interactive charts in simple powerpoints. It can be used with MS office 2003,2007 and 2010. You need to have Adobe flash player in addition to the Oomfo software. The basic version is absolutely free. download it here by clicking the link below. Oomfo is powered by Fusion Charts, an open source data visualization tooln for web. This picture shows their Promise! I must tell you that they did fulfill their promise. Download the software. Installation is simple. Here is the water fall chart ... created with ease in no time!